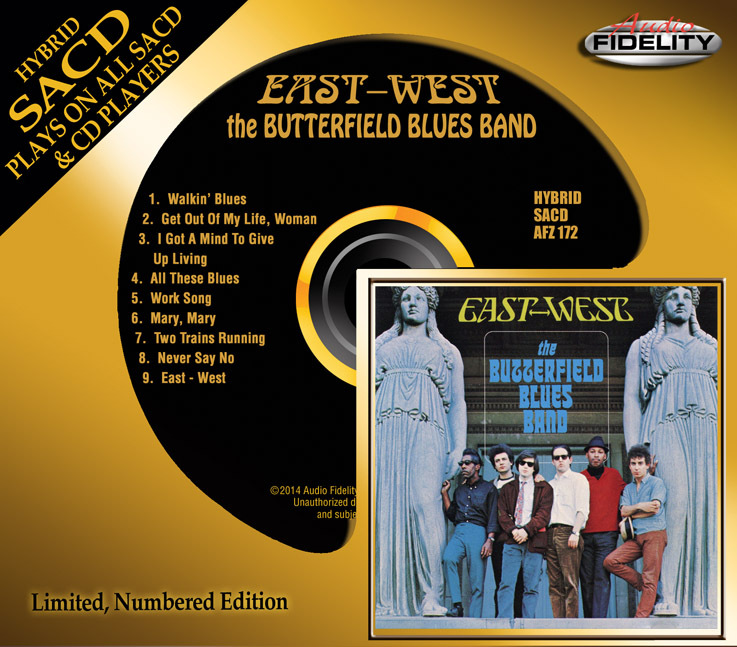 Camarillo, CA – Much to the excitement of blues aficionados worldwide, Marshall Blonstein’s Audio Fidelity is releasing The Butterfield Blues Band’s legendary ‘East-West’ album on Hybrid SACD on April 1, 2014. The Butterfield Blues Band had already shown on their first album that they had a definite command of the Chicago blues idiom. On ‘East-West’ they open up and branch out without losing the edge and drive of their first recording. ‘East-West’ represented a watershed for pop music…more maturity, better musicianship, more exploration, more successful blending of other genres. ‘East-West’ stretches the boundaries of the blues, above any other extended piece of the mid-Sixties; a rock band finally achieved a version of the musical freedom that free jazz had found a few years earlier. It can also be heard as part of what sparked the West Coast’s rock revolution, in which song structures with extended improvisation became commonplace. In 1966 when this album debuted, it was nothing less than astonishing. A mixed-race band? A white guy singing blues? A Jewish kid and a southern farmboy sounding like Robert Johnson on guitars? The album was recorded at the famed Chess Studios in Chicago. It peaked at #65 on the Billboard pop albums chart. This album features traditional blues covers and the guitar work of Mike Bloomfield and Elvin Bishop. The edge this band had was it had people from Chicago, the home of urban blues, who had grown up and played with all the greats. “East-West” combines the emotion and power of the blues along with the swing and instrumental dexterity of a great jazz band. The two centerpieces of the album, the instrumentals “Work Song” written by jazz great Nat Adderly, and the title cut “East-West” are recognized by many as the first recorded versions of jazz-rock fusion put to vinyl.